Sixty people are in the running to become San Francisco's next chief of police, the Police Commission announced Thursday night, but persistent questions over the acting chief's educational background might end up putting the number closer to 59. 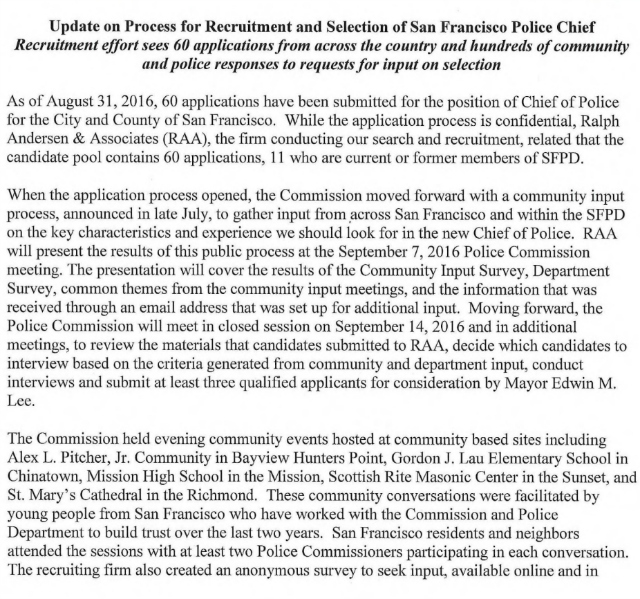 As previously reported, the search for SF's next top cop has been a fraught one, with help-wanted ads going up and down, as well as questions raised over why the job description for the best-paid police chief in the US ($316,732 with benefits) doesn't require a college degree. Following unrelenting rumors that the search for chief was "rigged" in Chaplin's favor, the acting chief told the Chron's Matier and Ross that, hey, “I probably have 200 credits,” and a college degree...but wouldn't say from where. But late Thursday that mystery was cleared up — somewhat — as Chaplin told the Ex "that he graduated with a bachelor’s degree from Colorado State University, but did not specify which campus, when he received his degree or what he studied." Even curiouser, "none of the three CSU entities could find any record that Chaplin attended or graduated from CSU." they report. Within an hour of the Examiner's report Thursday evening, SFPD's media relations office circulated a press release "on behalf of the SF Police Commission," Officer Grace Gatpandan wrote, a release that appears to make the thus-far troubled process appear more transparent. Here's their statement in full. Does it make you feel any better?